As newlyweds, one of our friends was very well known by everyone in town for a good reason. If you lived there long enough, you would be doing business with them. They owned the largest flower shop, the only funeral home, and the largest cemetery. Cliff understood more than the average person does at age 30 what really matters in life and what doesn’t. His question to anyone when asked for advice was this: Will this matter in ten years? 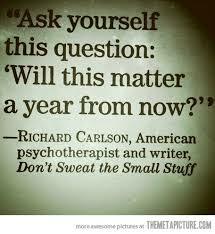 A famous book came out called ‘Don’t Sweat the Small Stuff (And it’s all small stuff). I liked the first half of the title. The second half? Not so much. There are some eternal matters, and a mortician will tell you to sweat about the ten year matters. What about you? How does this apply to you today?